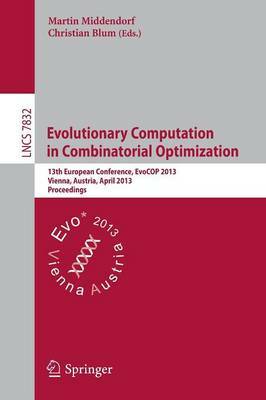 This book constitutes the refereed proceedings of the 13th European Conference on Evolutionary Computation in Combinatorial Optimization, EvoCOP 2013, held in Vienna, Austria, in April 2013, colocated with the Evo* 2013 events EuroGP, EvoBIO, EvoMUSART, and EvoApplications. The 23 revised full papers presented were carefully reviewed and selected from 50 submissions. The papers present the latest research and discuss current developments and applications in metaheuristics - a paradigm to effectively solve difficult combinatorial optimization problems appearing in various industrial, economic, and scientific domains. Prominent examples of metaheuristics are ant colony optimization, evolutionary algorithms, greedy randomized adaptive search procedures, iterated local search, simulated annealing, tabu search, and variable neighborhood search. Applications include scheduling, timetabling, network design, transportation and distribution, vehicle routing, the travelling salesman problem, packing and cutting, satisfiability, and general mixed integer programming.